Beltway inside press is already adjusting to a post-midterm, post-Sessions and possibly Ginsburg reality on this November Thursday and the next couple of press cycles will likely either zero in on the wrong angles of a nation full of election fraud and voter suppression stories. Already Democrat House leadership is using the words bi-partisan and cooperate in sentences that also contain the word President. Arizona's soon to be official senate seat swindle will not be blamed on the half-million people illegally purged from the voting rolls or the post elections tricks that follow. This author is expecting that centrist Democrats, rather than take yet another opportunity to stand on principle and defend the franchise of their own constituencies, will instead blame the left for their loss. As always they will scream right and then punch left. 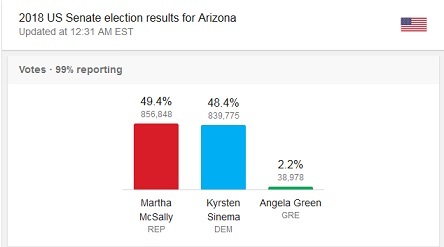 As can be seen from the latest results, Republican Representative Martha McSally is exactly one percentage point ahead of Democratic Representative Kyrsten Sinema with Green Party Candidate Angela Green holding on to two point two percent of the vote. The rhetorical attack on the third party should commence any minute. That attack will ignore real numbers. According to a lawsuit filed by ACLU, over 500,000 voters were illegally purged from Arizona's rolls. 258,000 were purged using Crosscheck, a software program with the racism custom built in by a Trump supporter. Fourteen percent of eligible voters were removed from the rolls. Ninety percent of those would have voted Democrat. The number of disenfranchised voters is more than six times the Green Party's vote total. There are votes still uncounted in this critical race for Senate. The Republican governor recently appointed John Kyl to racist war criminal John McCain just vacated in order to move to hell and sit at the right hand of Satan. We wish former Senator McCain good luck with his new position and his new home, we hear the brimstone lake swimming is lovely this time of eternity. Meanwhile elections, rather than partisan appointments, are stalled. 600,000 votes by mail remain uncounted. The method of counting has slowed these and arbitrary rules make them difficult to count. Lame Duck Arizona Secretary of State Michelle Reagan has ruled that mail in votes may not be counted after regular polls close, postmarks be damned. Each vote requires an exact match of an on file signature as judged by partisan county officials AFTER reading the whole ballot. The GOP has sued to not count the votes. This would mean that an additional thirty four percent of the actually cast votes do not matter. Those votes are again, predictably, in mostly Democrat leaning districts. So far there have been 1,734,000 votes cast, 600,000 being attempted to be ignored and 500,000 illegally struck from the rolls. This Senate Seat hangs by a balance of 17,000 votes or one percent. If everyone who had wanted to vote been allowed to cast a vote that counted the outcome would be different. Nearly thirty-nine percent of eligible voters did not count and of those ninety percent would have been in the blue column. Should the Democrats not vigorously defend the right of their core constituencies to vote they will loose a Senate seat. They will have left nearly one million votes on the table. That is one hundred seventeen percent of their current vote count. They will have sent a clear message to more than half their supporters that they actually do not matter. Should they blame the Green Party for getting three percent of the votes they threw away, it will send a clear message to the State of Arizona. That message is that 856,000 Republicans are worth more than 1,879 Democrats and Greens. That is minority rule by less than a third of the population which is incompatible with any working definition of democracy that this author knows. Should they blame 39,000 Green Voters, they will have joined with Republicans in enforcing totalitarian scapegoating on the left. Punch Left, Scream Right, this is how the game is played in the 21st century.